I love reading design blogs and fantasizing about having a Christmas tree with monotone ornament selection, a mantle filled with precious, lovely things, maybe even some snow globes sitting around. In reality, I have three sons aged five and under. I don’t have ANYTHING breakable that I can leave lying about. My oldest is even old enough to have opinions and ideas about decor. What I’ve had to do is gradually let go of my expectations for what my holiday decorating should look like and learn to enjoy what it does look like. I’ve always had a live Christmas tree, and I’ve gathered enough ornaments over the years to fill one with delightful balls and homemade treasures (like the painted macaroni on yarn my mom saved from when I was in kindergarten). But then, when my oldest kiddo was 18 months old, I realized a live tree in a giant bowl of water might not be the best fit for my family. I had to choose between constant vigilance, a system of gates and barriers…or getting a different sort of tree. One that wouldn’t offer him a murky bowl of drinking water in which he could hide things like my cell phone or the remote. That was the year I let go of the live tree. At that time, we put only soft ornaments on the bottom third of the tree and kept my precious ones up higher, out of his reach. 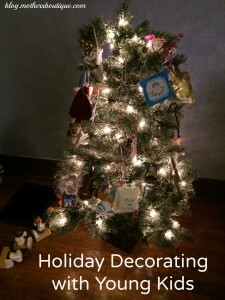 Each year since, my decorating has morphed until I’m left with construction paper chains, pipe cleaners dangling from the ceiling fan, and rubber decals on the windows. This year, we tried forcing paperwhite bulbs in jars filled with wee toys, which was great fun for awhile until my two-year-old threw a jar across the room. So we let go of live plants for the time being. I have my whole life to make my house look like a design blog at Christmastime. I have only a few precious years where my young sons delight in the magic of December. When my five-year-old lovingly colors a green stick figure on a scooter and begs to tape it to the wall above the mantle (where I’d rather hang a snowflake garland), I’ve learned to enjoy the drawing because he enjoys it so much. This year, my older boys decorated our 3-foot high artificial tree themselves. Each day, it is undecorated and re-decorated numerous times. Sometimes there are socks on the tree. Sometimes I find cereal bars wedged in there. Usually it’s strung with clumps of felted animal ornaments for which I have no emotional attachment. But they sure do! What joy they find in picking just the right spot for each fox or llama. My holiday decor doesn’t have a theme, usually looks a little shabby, and won’t ever make it into a catalogue. But I’ve come to enjoy it because to my small kiddos, our mess seems magical. How have you shifted your decorating expectations since having kids? Leave us a comment to share your experience!